Travels With My Sketchbook is a kind of literary time capsule. An amazing journal of Chris Riddell's experience as the ninth UK Children's Laureate, a role he held for a two-year period from 2015 to 2017. Open to the end papers and there are images of the covers of some of Chris' sketchbooks, including: one his mother gave him, a handbound one from Cairo, and one made by a local bookbinder. As he travelled the length and breadth of the UK, as well as around the world, Chris shared his visual storytelling and advocated for libraries and illustration. In Travels With My Sketchbook he shares that with us through a collection of 'illustrations, political cartoons, card games and poems,' all in his own distinctive style. Many of the illustrations were created as he participated in a wide variety of events and activities as Laureate. You'll see Chris speaking at book award ceremonies and universities, attending literary festivals, visiting libraries, schools, and galleries, and working in his studio. There are sketches drawn while travelling by train, portraits of people like Quentin Blake, and working drawings from books Chris was working on during his Laureateship (Goth Girl and the Wuthering Fright and Ottoline and the Purple Fox, amongst others). You'll also find political and social commentary that offers a snapshot of our continually changing world (be prepared for plenty of Brexit and related topics). And there are sketches of private, informal celebrations and stolen moments of rest. Much, though not all, of the book is in black and white and comes with handwritten captions or explanatory notes. Chris Riddell has twice won the Kate Greenaway Medal. He's written and illustrated many of his own books, the first of which was Ben and the Bear, and illustrated other people's stories, notably for Neil Gaiman and Paul Stewart. He has also illustrated new editions of classics like Rudyard Kipling's Just So Stories, Peter Pan by J M Barrie, and Treasure Island by R L Stevenson. With just over 300 pages, and hundreds of illustrations, there really is something for everyone in Travels With My Sketchbook. I have already poured over it for a couple of hours, and will continue to do so for quite some time to come. Travels With My Sketchbook is personal, humourous, serious, somewhat edgy, and inspiring. An absolute must for booklovers and observers of life. 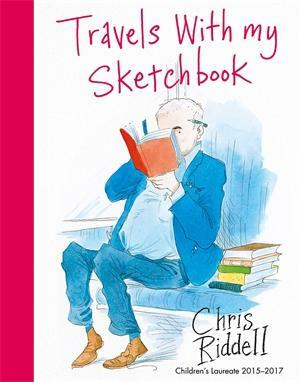 Do a search of Kids' Book Review to find reviews of books written or illustrated by Chris Riddell.